T-Mobile Sidekick 3 (aka Hiptop 3) is the replacement for the Sidekick II device, and is 20 percent smaller than the Sidekick II with measurement of 130 x 59 x 21.8mm, and weighs approximately 6.7 ounces. 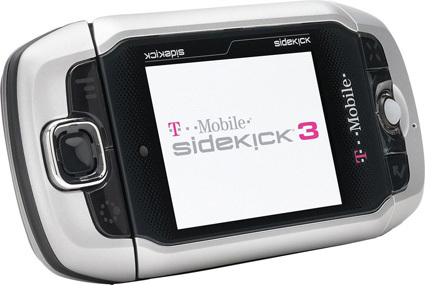 T-Mobile Sidekick 3 is powered with ARM9 processor and packs a 65k colors 240×160 pixel resolution LCD display. Sidekick 3 features a new trackball which provides one-handed navigation, built-in Bluetooth connectivity, double as MP3 player, Mini-SD card slot for expandable memory, supports EDGE connectivity, supports Tri-Band mobile networks, 1.3 MP digital camera and ability to connect to all three major IM networks including MSN, AOL and Yahoo!. MobileBurn (dead link) reviews T-Mobile Sidekick 3 and highly recommended the T-Mobile Sidekick 3 communication device with comment that “in my view, the Sidekick 3 has finally come of age. It now is phone enough for me to use on a day to day basis, while still offering most all of the advantages of a smartphone or PDA – including the best QWERTY keyboard available today. It isn’t small or light, but it is now fully capable of taking on the likes of Motorola’s Q or the Palm Treo line. As such, I give it a “Highly Recommended” rating. Laptop Magazine (dead link) writes that cell phones often inspire devotion, but few have a following like T-Mobile’s Sidekick. The device has long been the instant messaging and e-mailing device of choice among hipsters because of its nifty flip screen and comfortable rapid-fire keyboard. But users have griped about the poor camera, crippled Web browser, and lack of expandability. The Sidekick 3 improves those areas to varying degrees and delivers Bluetooth and a smaller design. However, this third generation isn’t the slam-dunk upgrade many had hoped for. As an upgrade, the Sidekick 3 could have been more dramatic. There’s no question, however, that the improved phone function and data service, in addition to the miniSD Card slot and music player, make this the best model in the line yet. The Sidekick 3 is a very good smart phone option for less business-centric users. CNet gives a very good editor’s rating of 7.3 out of possible 10, and concludes that “the T-Mobile Sidekick 3 brings some notable additions, such as Bluetooth and an MP3 player, and continues to be a solid messaging device for the younger crowd; we just wish it had a better screen.” The good points of the Sidekick 3 include a number of improvements, including a sleeker design, a 1.3-megapixel camera, an integrated music player, Bluetooth, and EDGE support. It also has a Mini SD card slot, a speakerphone, and world phone support. However, the bad points are Sidekick 3 suffers from a low-resolution screen, and speakerphone quality was subpar. It’s also a bit bulky and heavy, and camera options are limited. MSNBC (dead link) tests the Sidekick 3 e-mail device which is also tri-band GSM world phone and concludes that if you’re over 30 and in the market for a new smartphone, don’t be put off by the Sidekick 3’s teen appeal – especially if you don’t use or need Microsoft Exchange mail. The Sidekick might be just what you’re looking for. Plus, the under-30 crowd will think you’re very, very cool. PCWorld (link dead) has a first look on T-Mobile Sidekick email phone and concludes with very good score of 81 that that if the versatility that third-party apps afford and a petite shape aren’t priorities for you, the Sidekick 3 is a good connected handheld for e-mail, messaging, and Web browsing. Heavy phone users might prefer a device with more straightforward dialing options; but for anything involving typing, the Sidekick is hard to beat.